The configuration of the sails is shown in Fig. 1. The mainsail geometry and initial shape are derived from a plate airfoil design with maximum camber of 15% cord length located at 30% cord. 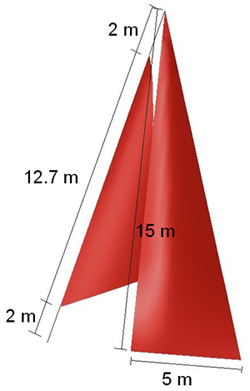 The dimensions are 15 m along the mast and 5 m along the foot. A single jib sail was proportionally generated from the mainsail and is 12.7 m along the luff (leading edge). 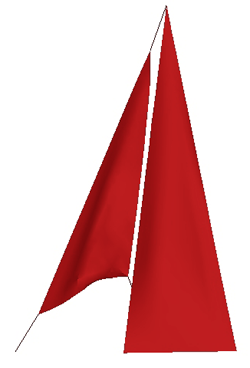 Mainsail nodes are fixed along the luff and foot and free elsewhere. All nodes of the jib are free, with the head (top corner), tack (front corner), and clew (aft corner) attached to cables with fixed ends. 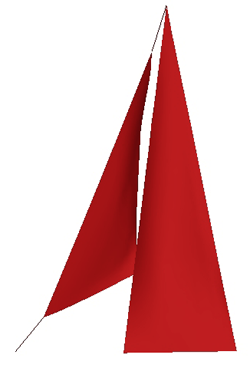 The airflow velocity is 7.72 m/s (approximately 10 knots) at an angle of 35 degrees from the centerline of the boat (not modeled). The thickness, density, stiffness and Poisson's ratio for the sails are 1.0 mm, 1,370 kg/m3, 3.0x10^9 N/m2 and 0.3, respectively. The diameter, density, stiffness and Poisson's ratio for the cables are 6.35 mm, 1,440 kg/m3, 3.0x10^9 N/m2 and 0.3, respectively. The numerical methods used in this computation were introduced and implemented on parallel computing platforms by the T*AFSM. The set of numerical methods introduced by the T*AFSM over the years and used in this computation includes the DSD/SST formulation [1-4], the quasi-direct FSI method [5, 6], the stabilized space-time FSI (SSTFSI) technique , and a number of special FSI techniques [7-9]. Among the special FSI techniques used in the computation is using incompatible meshes at the fluid-structure interface as a means for limiting the excessive bending to narrow regions near the edges. This is accomplished by increasing the structural-mesh refinement near the edges without an equal refinement increase for the fluid mesh in the same regions of the fluid-structure interface (see [8, 9]). The computation was carried out on the ADA system at Rice University. For more details on this computation, see [8, 9]. Fig. 1. Configuration. For details, see [8, 9]. Fig. 2. 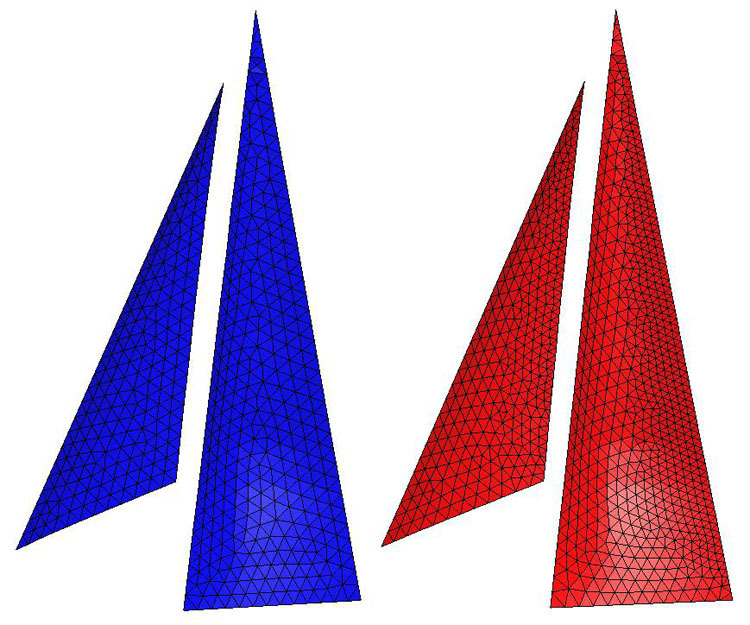 Fluid mechanics mesh at the interface (left) and sail meshes (right). For details, see [8, 9]. Fig. 3. Sails at various instants. For details, see [8, 9]. 8. T.E. Tezduyar, J. Pausewang and S. Sathe, "FSI Modeling of Sails", Computational Methods in Marine Engineering, Marine 2007, E. Onate, J. Garcia, P. Bergan and T. Kvamsdal (Eds), CIMNE, Barcelona, 2007. 9. T.E. Tezduyar, S. Sathe, J. Pausewang, M. Schwaab, J. Christopher and J. Crabtree, "Interface Projection Techniques for Fluid-Structure Interaction Modeling with Moving-Mesh Methods", Computational Mechanics, 43 (2008) 39-49.